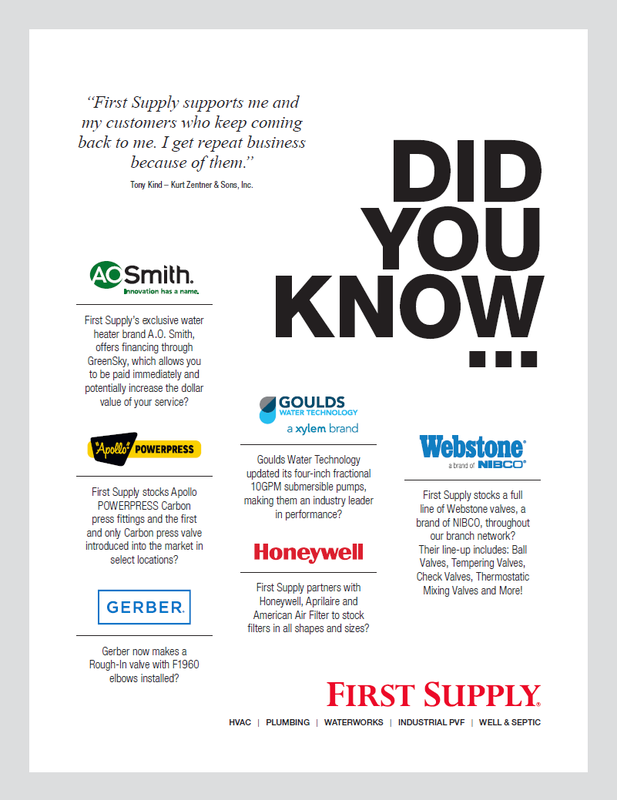 First Supply features the products most asked for and used by trade professionals. Listed are our top Industrial PVF brands that are stocked at most locations. Contact the First Supply location nearest you for inventory on the specific product you are looking for. A.Y. McDonald, Allied Fitting, Aloyco, Anaco, Anvil, Apollo, Aquatechnik NA, Asahi, Bee Valves, Bonney Forge, Bonomi, Cambridge-Lee, Fluidra, Cerro Flow Products, Charlotte Pipe, Cimerio, Conbraco, Cooper B-Line, Core Pipe Products, Crane Valve, Cresline, Dixon, Dowco, Elkhart Products Corp., Empire, EXLTUBE, Febco, Fernco, Gastite, George Fischer, GPK Products, Green Leaf, Guardian, Haitima, H.O. Trerice, Holdrite, Ipex USA, John Guest, Jomar Valves, JM Eagle, Kelly Pipe, Kessler, Legend Valve, Matco-Norca, Merfish, Merit Brass, Milwaukee Tool, Milwaukee Valve, Mueller, NIBCO, North American Pipe Corp., Orbinox, Orion, Poly-Conn, Reliance Worldwide Corp., Ridgid Tool, Rub Valve, Sharpe, Smith-Cooper, Spears, Stainless Flow, Sunbelt Group, Ta Chen, TMK IPSCO, Trerice, Tylok, Uponor, United Brass Works, United Pipe & Steel Corp., Ward, Warren Alloy, Watts, Webstone, Weldbend, Wheatland, Wilkins and Zurn Industries. — John Lynch, Total Mechanical, Inc.